Sporting the Pennzoil livery--one of the most iconic brands in motoring--the #93 SRT Motorsports Viper GTS-R is a mid-season entry in the 2012 American Le Mans Series. Driven by Marc Goosens and Tommy Kendal--with IndyCar driver Ryan Hunter-Reay on deck for endurance races--the #93 certainly doesn’t lack for driving talent. This SRT factory-backed ride is one half of the long-awaited return of the Viper to ALMS racing. The Viper’s last factory race was way back in 2000. 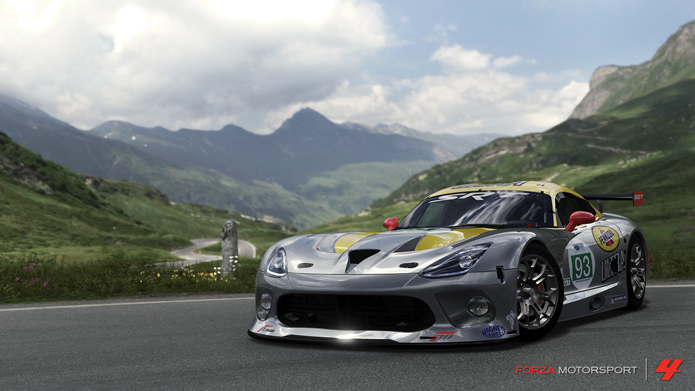 This new SRT Viper GTS-R is engineered for speed, reliability, and durability. Its primary focus is to dominate endurance races such as the Petit Le Mans at Road Atlanta and the 24-hours of Le Mans in France. One of the most beautiful cars ever built, the lightweight powerful Alfa Romeo 33 Stradale also holds the record of being the most expensive new car sold in the US of its time at around $17,000. Initially as many as three of the extremely rare Stradale came to North America, but now only one remains on the continent. The car modeled for Forza Motorsport 4 is part of one of the greatest private collections of Italian cars in the world. These cars were ahead of their time, using butterfly-style doors, large wrap-around glass, twin-spark ignition, dual-overhead cams, a six-speed Coletti transmission, and plenty of lightweight magnesium parts. As you start the two-liter V8 engine, it doesn’t take long to realize the powerplant is only inches behind your head. With an RPM redline of 9,500--outrageous for 1968--you hear a symphony of sound from rumble to scream. The DB4 GT Zagato is widely considered one of the most desirable Aston Martins ever made. Only 20 were originally built, making the GT Zagato DB4 a rarity among rarities. The design of the car was entrusted to the then-23-year-old Ercole Spada, who worked for the famous coachbuilder Gianni Zagato. This was the first of numerous successful partnerships between Aston and Zagato. Because these cars were hand-built, each has its own personality but all were lighter, faster, and slightly smaller than the Aston Martin DB4 they were based upon. The engines enjoyed a higher compression ratio than the standard DB4 and produced as much as 314 hp. The rolling chassis, complete with engines, were shipped to the Zagato factory in Milan where the lightweight alloy bodywork was created. In their day, the DB4 GT Zagatos raced well against Ferrari, Alfa Romeo, and others, and always looked and sounded fantastic while doing so. The Sprite MKI was commonly known as the Bugeye Sprite in the U.S., or Frogeye Sprite in Europe due to the bulging headlights in the bonnet. The Sprite was an inexpensive, fun sports car at a time when the only other sports cars made were quite pricey. Within a year of launching the Sprite, the small factory at Abingdon was producing 450 cars per week. When Carroll Shelby started his School of Performance Driving, he used Bugeye Sprites as the part of the training tools. The car modeled for Forza Motorsport 4 had sold new through a dealer in Seattle and stayed in the area. The current owner has had the car most of its existence, even using it as a daily driver for more than 10 years, then restoring it twice over the years. If you spot a Nevada Beige MK1 Sprite at one of the many Pacific Northwest car rallies or shows, you just may be looking at the Forza Motorsport 4 model car. Just as it is in the game, it is a fun, lightweight sports car that makes you smile everywhere you go, whether you are appreciating its unique look or blazing down the road with the wind in your hair. Most legends come from humble beginnings, and the story of the Corvette is no different. In an era where the only true sports cars were built in Europe Chevy saw an opportunity. The company went about building a dream team to design a car that would appeal to a younger market, give the brand some flash, and keep it ahead of Ford in sales. Harley Earl—GM’s then design chief—let fly with an idea he had been coveting for more than a year since watching European sports cars at Watkins Glen: a low to the ground, two-seat roadster. Driven by practicality, the 1953 Corvette uses mostly off-the-shelf components such as the “Blue Flame” 160 hp, 235 cubic inch, in-line, six-cylinder and two-speed Powerglide transmission. The only options available were a heater ($91) and an AM radio ($145). All 300 that sold in 1953 had both options. The 1953 Corvette didn’t even have rollup windows. All the cars were hand-built, and all were Polo White with red interiors. The use of fiberglass was not only a weight-saving innovation but was a necessity due to the Korean War and a limited availability of steel. The 1953 Corvette’s dramatic and bold exterior was just what the public wanted and it forever changed the course of American car history. In the mid-1960s, the MGB GT offered European refinement for a price the average car buyer could afford. A fastback-style roof, designed by Pininfarina, and accommodating headroom for driver and passenger made for comfortable road-going ability. The car’s raspy in-line four cylinder delivers almost 100 hp, more than enough to make driving the MGB GT an exciting exercise. For its time, performance was considered brisk; it was lightweight and featured fine handling as its strong points. The MGB was a relatively modern design, utilizing a monocoque structure. This reduced manufacturing costs while adding to the overall strength of the car. The MGB was also one of the first cars to include controlled crumple zones to protect both driver and passenger. A treasured masterpiece, the original Mercedes-Benz 300 SLR is housed in a glass case at the Mercedes museum. Never again will it see the pavement or the risks of racing. In fact, it may be one of the most valuable cars in the world. Driven by a young Stirling Moss and co-driven by journalist Denis Jenkinson, it won the 1955 Mile Miglia rally in record-breaking time and achieved incredible speed--a full 32 minutes faster than Juan Manual Fangio, who placed second in the other 300 SLR. Moss’s record time to finish the famed Mille Miglia in the 300 SLR has, to this day, not been beaten. The 300 SLR’s straight 8-cylinder engine, with state-of-the-art fuel injection and desmodromic valve actuation, gave high-revving reliable power. Depending on the tune applied and fuel type used, the car produced between 276 and 310 hp. Sadly 1955 also saw the end of Mercedes’ works-supported racing after the tragic accident at Le Mans. Mercedes did win the 1955 sports car championship, despite retiring at Le Mans out of respect for those who died. Later Sir Stirling Moss was invited on several occasions to relive the 300 SLR’s glory in vintage races before it was permanently retired. ”The Volkswagen Karmann Ghia is the most economical sports car you can buy… it's just not the most powerful.” So says the announcer in the commercial introducing the Volkswagen Karmann Ghia. Although it’s true enough that it was never a powerful sports car, in the looks department the Karmann Ghia has character and style in spades. Automotive historian Jan Norbye called out its stylistic similarities to the Alfa Romeo 2500 S and the Lancia Aurelia. Those styling cues are no doubt Italian, as the Karmann Ghia was designed by Ghia, a prestigious Italian design firm. Karmann coachworks was under orders to design a sports car to build over the VW chassis. After several of their proposals were rejected, Karmann reached out to Ghia, who delivered a prototype that perfectly hit the mark. The car has seen more than 20 years of production and the only cosmetic changes were larger bumpers and head and taillights. If the GMC Vandura isn’t the most classic van of all time--and it may well be--it certainly has the coolest name. Be it a work van, party-wagon, or a rig worthy of toting B.A. Baracus and the rest of “The A-Team” around, this half-ton hauler has potential. It’s television-inspired fame has gotten it on the “Fifty Most Famous Cars” list. What you do with it is up to you in Forza 4. With the right wheels, and livery, the Vandura can be anything you can dream of. It's also a veritable canvas for your designing delight and, when tuned properly, this van drifts, slides, and gets sideways with the best of them... the best of the vans that is. Accompanying the September Pennzoil Car Pack will be a new batch of Community Monthly Rivals Mode events. A special Rivals Mode featuring the 2013 Viper GTS-R’s will be available to welcome these latest additions to the American Le Mans Series. We’ll also be awarding unicorn cars to 100 random players per week who set a leaderboard time in the yet-to-be-announced Rivals event featuring the Vipers. The September Pennzoil Car Pack is not included as part of the Forza Motorsport 4 Season Pass, which concluded with the April Alpinestars Car Pack. Season Pass owners will need to purchase the September Pennzoil Car Pack separately.